Today, February 2, is Groundhog Day, the day when we learn whether we shall have six more weeks of winter or an early spring, a prediction based upon whether a groundhog sees his shadow or not. What is a groundhog and how did he become a weather predictor? 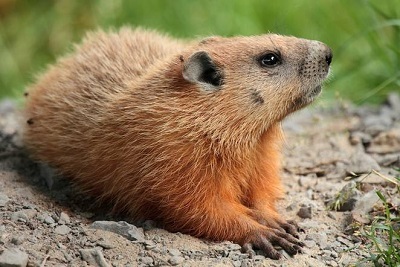 Groundhogs, also called woodchucks or whistlepigs, are rodents, members of the marmot family. They are primarily plant-eaters although the one who lived in my yard was quite fond of birdseed, often raiding my bird feeder. They are burrowing animals and efficient diggers (just look at those feet), weighing from 4 to 9 pounds and ranging in length from 16 to 26 inches. The roots of Groundhog Day go back to an early Christian celebration, Candlemas, the Purification of the Blessed Virgin or the Feast of the Presentation of Christ in the Temple, held on Feb.2. Germans began to associate a sunny holiday, a day when a hedgehog could see his shadow, with six more weeks of winter. When German immigrants came to Pennsylvania, they found no hedgehogs, but there were numerous groundhogs and they decided that the groundhog would become the weather predictor. In 1887 a group of Punxsutawney, Pennsylvania, hunters formed the Punxsutawney Groundhog Club; one of the members was editor of the local newspaper and he claimed that their groundhog, Punxsutawney Phil, was the only accurate predictor. Punxsutawney Phil eventually became famous. But are his predictions accurate? Statistically no, he has been correct only about 39% of the time. So will he see his shadow today, bringing six more weeks of winter, or will it be a cloudy day, predicting an early spring? “Groundhog Day,” a romantic comedy starring Bill Murray, Andie McDowell and Chris Elliot, tells the story of a TV weatherman (Murray) sent to Punxsutawney to cover the annual Groundhog Day events. This is just one DVD in Falvey’s collection available for your entertainment. The Digital Library has available a recording, “Groundhog Day” by Mark Simos, for your listening pleasure. Groundhog photograph from Wikimedia Commons. The sun is shining here so the groundhog will see his shadow. Six more weeks of winter – ugh!